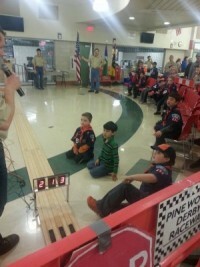 Another great Pinewood Derby event and a good time was had by all, or so I was told. I had fun for sure as well. I am pleased to report that multiple parents, leaders, family members, friends, and scouts repeatedly came up to let us know how fun the event was. This is so important to our Pack to have fun at these events. Sure there are many life lessons that can be taken from events such as these but fun is number 1. 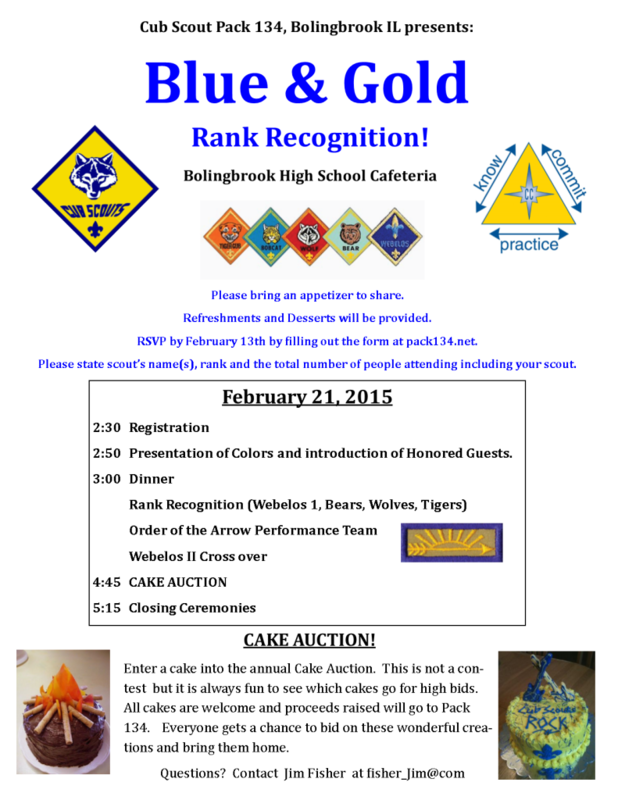 I would like to recognize and thank on behalf of Pack 134 those that made the event possible. I would like to offer an apology to those I will surely miss in the recognition. It’s time once again to recognize our boys making rank and giving special recognition to those boys that have graduated from their Cub Scout Journey and are prepared to move forward on their life journey. Scouting provides your son with a positive peer group and a program that is fun and adventurous helping him to “be prepared” to shape his own future. Pack 134 is sponsored by The Veterans of Foreign Wars Post 5917 in Bolingbrook, Illinois. As a Cub Scout your son will be a member of a Den that meets during the month, is led by a Den Leader (a fellow parent) and consists of 4 to 10 boys of the same grade level. The various Dens combine to form our Pack, which meets the third Tuesday of each month at Pioneer School. Pack Nights are led by our Cubmaster who leads the conducts of ceremonies and presentations of awards earned during the preceding month. Pack Night is an excellent opportunity to share experiences, new skills and enjoy projects displayed by the various dens. The Pack is guided by the Pack Committee which is made up of parent volunteers and includes positions such as: Committee Chair, Treasurer, Popcorn Kernel, Awards, Secretary and members at large who all help coordinate pack activities, meetings, rank advancements, outings and policy. Pack 134 is a dynamic group, boys generally join our Pack in first grade and advance through fifth grade at which time they graduate to Boy Scouts! As such, our leadership is also a dynamic group as leaders, committee members and volunteers advance “through the ranks” with their boys and move on to Boy Scouts. We look forward to including each and every parent in our Pack…being a volunteer is fun, challenging and rewarding!